The price of good quality tequila today can be frightening given the fairly brief wood ageing most such spirits receive, certainly when compared with the lengthy time in oak afforded even fairly modest whiskies and brandies. In comparison, tequilas with less than a year in oak (or even none) can top £80, while those with as little as five years slumber can easily go north of £160 for a full-sized bottle. As for some super-premium brands, remortgage your house. If nothing else this demonstrates the change in perception of this mercurial spirit over the past 10-15 years. The demand for high-quality tequila – today numbering seemingly hundreds of brands – is such that the market can support such prices, especially in the US where the spirit is now taken very seriously. My salary, alas, cannot. Fortunately, I paid no such bounty for this beauty, although that was more luck than judgement. Another bottle picked up on business, this time at New York’s amazing Park Avenue Liquor store in 2000, I paid about $40, only discovering that it’s true price was around $120 when I arrived home. In truth, I may well have paid that for it had I known. 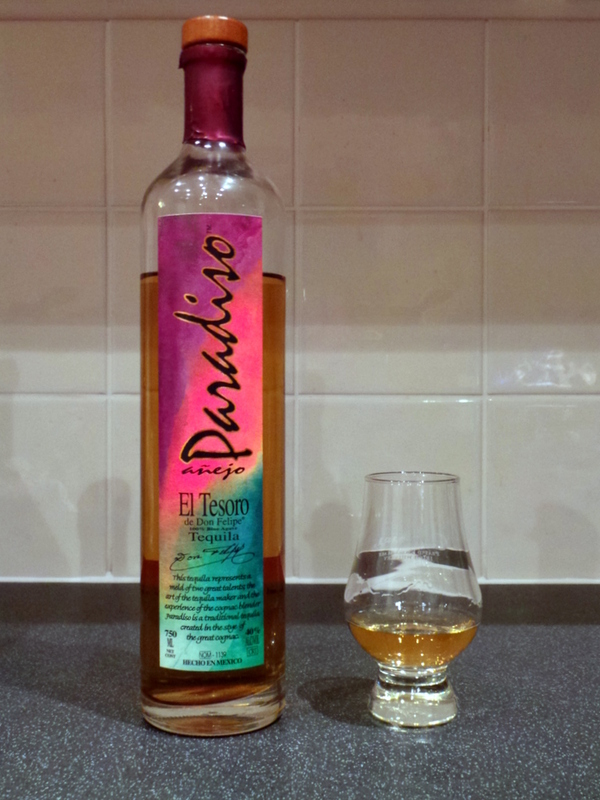 For a somewhat random purchase – I went for a bottle that both looked good and that I could afford – El Tesoro Paradiso was a revelation. It still is. Unusual at the time of its introduction, El Tesoro Paradiso is a 100% agave spirit aged for five years in small oak barrels, making it an ultra-aged añejo in the modern lingo. (In comparison, a blanco is unaged, a reposado is aged a minimum of two months but less than a year, and a conventional añejo is aged a minimum of one year but less than three years.) It was doubly uncommon for being finished in Cognac barrels, the result of a collaboration with A. de Fussigny Cognac and clearly intended to take the brand upmarket. The effect is to add a spicy, rather sophisticated veneer to the spirit. But even this treatment can’t restrain the pungency of the baked piñas of blue agave, which rips through with almost indescribable flavours of overripe fruit and volatile organic compounds. Mandarins, passion fruit, boiled sweets, a little nail polish, and even burnt rubber spring to mind. But I’m not sure. El Tesoro Paradiso is made in the heart of tequila country, the western Mexican state of Jalisco. 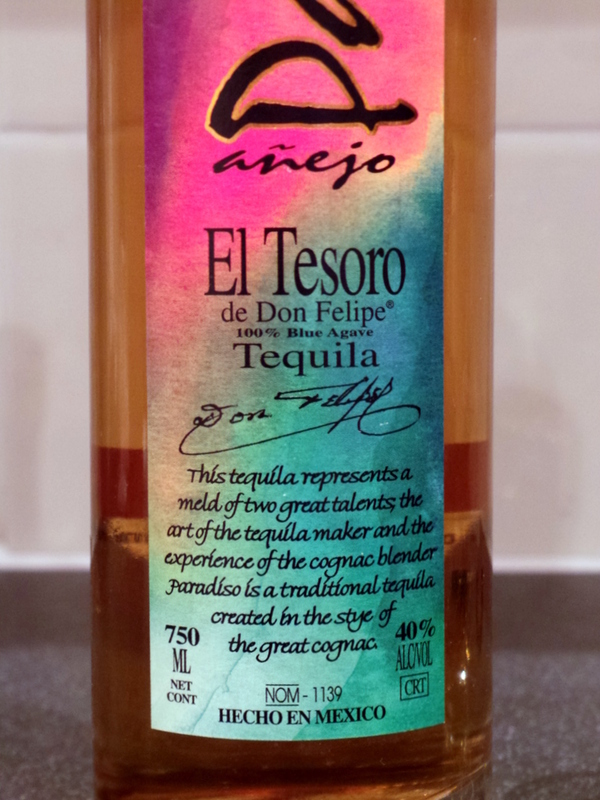 As global interest in tequila has grown, so El Tesoro Paradiso (still in the same packaging) has become far more widely available and can be picked up at good online retailers such as The Whisky Exchange for a quite reasonable sum by today’s standards. As a multi-award winner since I acquired my bottle, El Tesoro Paradiso is a good place to start for drinkers interested in getting to know premium tequila at a tolerable price. Today, the producer also has a couple of even more premium brands while for those on a slimmer budget, El Tesoro also produces a range of lower cost tequilas in the major age categories. While it may be an acquired taste, tequila has grown up and can stand comparison with the world’s other great spirits. Certainly, there are none of the harsh edges here that used to blight the slamming tequilas so beloved of holidaying teens and twenty-somethings back in my day (and probably still do) and which gave the spirit a reputation as cheap “rocket fuel”. I’m glad to have used this excuse to reacquaint myself with a truly great alcoholic experience. It won’t be years before my next indulgence.